Improve customer and member satisfaction and more efficiently manage support and service requests using the Portal Prodigy Help Desk. The Portal Prodigy Help Desk can be used for processing and managing a variety of interactions including warranty claims, service requests, product returns, maintenance and support requests, project requests, consulting requests, training requests, resource requests, research requests, event planning, questions and assistance with problems. The Portal Prodigy Help Desk automatically logs time and produces invoices for billable services and products. You define the information (data fields) that you want to collect. All information is indexed and searchable as part of your organizations Help Desk knowledgebase. Help Desk integrates with Document and Resource Management, Task and Tickler Notes Management, Project Management, Item and Order Management, and Billing and Collections Management to provide a complete interaction management solution. Define an unlimited number of request types with unique data entry forms for each type. 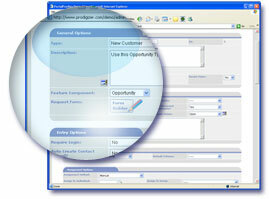 Self service customer request entry screen – used by customers/members to initiate requests and report problems. Self service customer request status reporting screen – used by customers to check status of requests and work being performed, and to provide additional information. Administrative help desk request entry screen – streamlined for quick input of requests and initial troubleshooting by help desk (support) staff. Administrator (help desk support operators) scripts – provide instructions and scripts for client interaction, applicable to specified type of request. Definable data elements (questions) for Request entry forms. Data elements can be specified for both Customers and Administrators. Define unique data elements for each request type. Include a grid for entry of multiple items within a single request such as items to be returned or items to be quoted. Eliminates need for customer to fill out separate requests for each item. Include memo fields for entry of long descriptions and cut and pasting from other applications. Include list boxes for selection of pre-defined values. Include radio button selections and checkbox options. Help Desk Knowledgebase – provide access to prior requests and descriptions of resolutions via keyword search. Track billable time and non-billable time. Create Work Orders for authorizing and tracking billable time. Support service (maintenance and support) agreements as blanket Work Orders covering costs for specific request types and tasks. Automated time entry and manual time entry. Assign tasks to staff based on requests. Assign separate rates permissible by task type and customer. Assign default rates to each customer. Billable time approval process that allows manual adjustments by permissible staff. Generate electronic invoices for billable time and automatically email to customers. Print customer invoices for billable time. Scheduled recurring billing for service agreements. Define project deliverables with estimated and actual dates. Attach documents to requests and projects. Define project milestones with estimated and actual dates. Send automated email notification with link to request to customer (requestor). Send automated email notification with link to request to members of specified group or individual when new requests are entered by customers. Option to send automated email notification to requestors with solution or as notification that request has been completed and link to request in customer request status page. Quick view of customer request history available from Administrative Help Desk. Task template option – timesaver to copy Tasks such as standardized milestones, deliverables and document requirement tasks from a template into a new Request. View tasks and project by vendor, staff, and hierarchal structure (timeline/dependency order). Quick payment entry from Administrative Help Desk for billable requests not covered by a service agreement. Access to operating manuals from Administrative request entry screen. Billable requests create standardized order. Auto retrieval of customer information including address, credit terms, and maintenance contract status. Specify payment terms and enter payments directly from Request Management. Allow customers to enter requests for quotes. Request can then be priced and converted to orders. Sends automated quotation to customer with link to place order. Allow customers to enter bid requests. Request can be then priced and converted to orders. Sends automated bid response to customer with link to place order.